The college is situated in a very remote and backward area of the District Basti. In order to promote the education in this very part of the district the college was started with a mission to provide the best education to the boys and girls of the poor farmers, who for their education were escaping for the there places to different cities. With the establishment of the college the students residing in almost 20 kilo meters in radius are getting the best education. 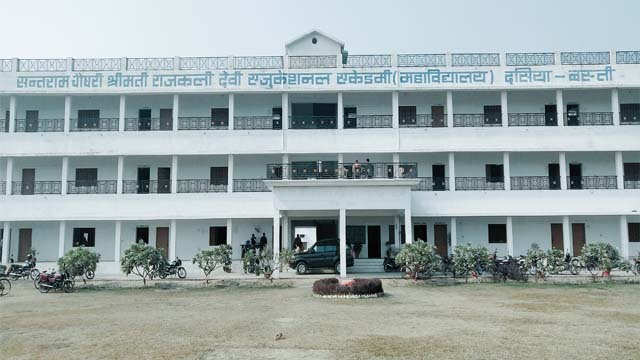 The college campus is nestled in approximately 2 acres of greenery with the College buildings, administrative block and employees accommodations on the campus along with a guest house. However, as college buildings are; all on aligned departments and faculties are easily accessible and monitored. The campus being one of the greener parts of the Ganeshpur is serene and beautiful. Santram Chaudhary Smt. Rajkali Devi Educational Academy, Sehmo, Dasiya, Basti Welcomes You.